Earls, barons, lords and marquis — these titles are foreign to countless Americans. Yet to those in Scotland and England, they are the stuff of ancient times, with some left over to the modern age. We are interested in the last title, but only as it referred to the Marquis of Argyle, Archibald Campbell. From an early period in Scottish history, his ancestors played a prominent part. Vast domains were under their rule, with great power exhibited by this house. It was said, for example, that today’s subject, Archibald Campbell, could have fielded an army of twenty thousand soldiers. Well, you could imagine the gratitude of God’s people when Archibald Campbell joined the Covenanting Presbyterians at a General Assembly in 1638. At the first and last coronation ceremony in which King Charles II was crowned in Scotland, which we developed for our readers on January 1, it was this Marquis himself who placed the crown on the head of Charles the Second. We also saw that such early support would be repaid with years of persecution for Scottish Presbyterians, including the Marquis of Argyle himself. When Charles finally ascended to the throne, Archibald Campbell traveled south to congratulate him. 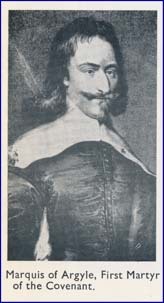 He never arrived in London, but was arrested on the journey there on February 7, 1661. Clapped into the Tower of London, he lay in chains until the following winter. Then he was sent back to Scotland to be tried on everything from having signed the Solemn League and Covenant, to submission to Oliver Cromwell, to being acquainted with the plot to kill King Charles the First. One would think that such a sentence would be met with a grim spirit. But such was not the case with this Covenanting Christian. He commented upon hearing the news that “I had the honor to set the crown on the King’s head, and now he hastens me to a better crown than his own.” Ascending to the place of execution on the day, he “blessed the Lord,” adding “I pardon all men, as I desire to be pardoned myself.” With that, and other expressions of the forgiveness granted from Calvary, he went forth to be with His Lord and Savior. It is said that in life he had “piety for a Christian, sense for a counselor, courage for a martyr, and a soul for a king.” With all these characteristics, he was among the first of the Covenanters to lay down his life for the Covenanted Reformation. Words to Live By: Paul reminds us in 1 Corinthians 1:26, “not many [of you were considered to be] wise according to human estimates and standards, not many influential and powerful, not many of high and noble birth . . .” The apostle did not say “not any” were called, but “not many were called.” We have in the Marquis of Argyle one such wise, influential, powerful and high and noble individual, who was called to stand up for the faith. This is ever so slightly tangential, but one can remember the order of precedence in British nobility, from highest to lowest, by the mnemonic question, “Do Men Ever Visit Boston?” Duke at the top (no higher nobility; only royalty is higher), then Marquis, Earl (called a “count” in continental Europe), Viscount (like vice-count), and at the bottom is baron. Actually, there are baronets these days, but not in Argyle’s day. Thanks for the tangent as I love learning minutiae and all things Presbyterian.